Guide to Hood River County, Oregon ancestry, family history, and genealogy birth records, marriage records, death records, census records, family history, and military records. County Records Inventory listing the records held at the Hood River County Court House as of July 2009. Hood River County Court is structured differently. Check the County Records Inventory link for addresses for location of records (left column). Named for Hood River, a tributary of Columbia River. History of Oregon, Carey, Charles Henry, Chicago: Pioneer Historical Pub. Co., 1922. History of Wasco County, Oregon, McNeal, William H., The Dalles, Ore.: unknown, 1954? Portland, Oregon, its history and builders, Chicago:Gaston, Joseph, S. J. Clarke Pub. Co., 1911. Portrait and biographical record of Portland and vicinity, Oregon, Chicago: Chapman Pub. Co., 1903. Historic Oregon Newspapers as a division of the Oregon Digital Newspaper Program has digitzied more than 644,000 pages of newspapers throughout Oregon. Dates range from 1846-1922 with selected issues continuing through 1973. ↑ Handybook for Genealogists: United States of America, 10th ed. (Draper, Utah: Everton Pub., 2002), Hood River County, Oregon . Page 572-574 At various libraries (WorldCat); FHL Book 973 D27e 2002; Alice Eichholz, ed. Ancestry’s Red Book: American State, County, and Town Sources, Third ed. (Provo, Utah: Ancestry, 2004), 563-564. ↑ Handybook for Genealogists: United States of America, 10th ed. (Draper, Utah: Everton Pub., 2002), Hood River County, Oregon page 573, At various libraries (WorldCat); FHL Book 973 D27e 2002. ↑ Wikipedia contributors, "Hood River County, Oregon," in Wikipedia: the Free Encyclopedia, https://en.wikipedia.org/wiki/Hood_River_County,_Oregon, accessed 10 November 2018. 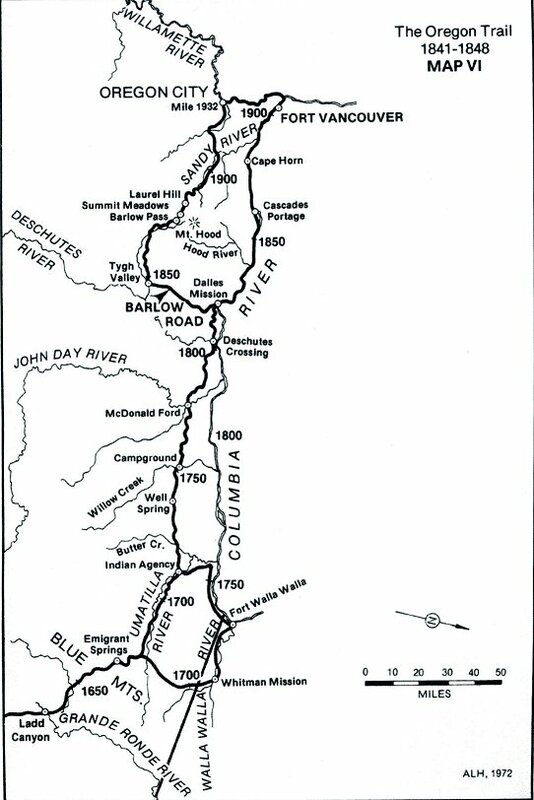 ↑ Jim Tompkins, "The Oregon Trail 1841-1848 Map VI" in Oregon Trail Landmarks at http://www.oregonpioneers.com/OTMap6.jpg (accessed 18 July 2011). This page was last modified on 4 April 2019, at 16:29.